Most people barely use any keyboard shortcuts. They just don’t. And this is such as shame because there are so many amazing shortcuts that can radically change the way you use PowerPoint - not just in terms of time saved (you can shave MONTHS of time in a given year if you use them), but also in terms of the hidden advantages they bring. However, I began noticing a few years ago that the computer manufacturers started inverting the Function keys. That is, when you hit F1 or F2 in a program, instead of getting the program level shortcut you are SUPPOSED to get, instead you get a bunch of media junk like volume, mute, etc. This complicates all of your Function key shortcuts by forcing you to hit an additional key. For example, to Save As within a document, instead of just hitting a naked F12, you instead have to hit Fn + F12. And when you Save As 100 times a week like I do, that’s a lot of extra keys to hit. The point is, if you’re a document jockey like me – someone who spends an ENORMOUS amount of time creating and updating documents – this will drive you crazy as you are missing out on some excellent keyboard shortcuts. I almost returned a BRAND NEW computer that I loved because of this quirk before I realized it was fixable. ​Fire up PowerPoint, Word, or Excel. ​Hit a naked F1 key (that is the F1 without anything else). ​Evaluate whether you got the Help Menu, or a system control like Mute? If you got anything other than the Help menu, your Function keys are messed up. Resetting your Function keys is a pretty simple process. 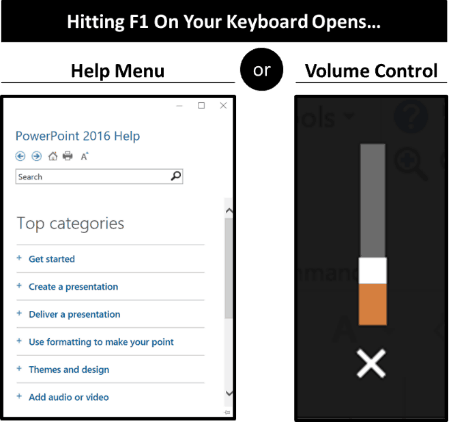 To see how to do it and follow the steps, go to this article on fixing your Function keys. Warning: To fix your Functions keys, you’ll need to restart your computer and make some changes to your System BIOS. As such, I recommend re-opening this page on a separate screen, such as an iPad, so you can follow along.